The half-kneeling position is a great way to assess and treat your patients hip and core stability. While it seems like an easy exercise, it has many subtleties that can make or break the position. Having a greater understanding of the half-kneeling position will help ensure that your patient achieves the maximal benefit. Kneeling eliminates the ability of the ankle and knee joints to provide stability. This means less degrees of freedom to compensate with. All efforts to maintain posture will achieved through the hip and core. Never let the trunk move. Remain in a tall stable spine posture. 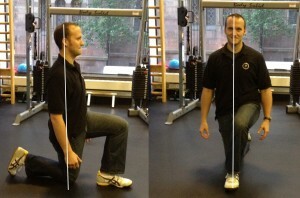 Any patient with a LE asymmetry or hip/core impairment should be tested. To test, simply place them in this position for 30 seconds and look for a loss of posture. By assessing bilaterally you will be able to determine any asymmetries. You can also look at their direction of loss of postural control to further determine where their specific impairment is located. After placing your patient in this position you will have a better assessment of their hip and core stability, as well as any asymmetries in the proximal kinetic chain. You’ll be surprised by how many people can not simply maintain this position without losing postural control. Before progressing with dynamic exercise it is of paramount importance that they are able to maintain stability for at least 1 min. If you don’t develop proximal stability before distal mobility then you will be setting yourself up for compensations later on in the plan of care. Once the patient displays stability the flood gates open and you can start letting your creativity run wild. The greatest part about half-kneeling is that it is just a base of support. You could add an asymmetrical load to further challenge lateral and rotary stability or simply add a symmetrical load to increase the force. The possibilities are endless. It simply depends on your patients impairments and your clinical intentions. Hodges PW, Richardson CA. Relationship between limb movement speed and associated contractions of the trunk muscles. Ergonomics. 1997;40:1220-1230.